Myeong-dong Hotel Metro was opened in December 1960. Renewed in April 2005, following the 2014 renewal is turned into a more convenient and clean. Some facilities are renewed it is more convenient. Gym and playroom, terrace lounge to spend time in the hotel had made ​​more comfortable. In addition, each floor as well as a computer room, even the PC was installed elevator hall. speed wi-fi for those who stay powered up the business can stay without stress. 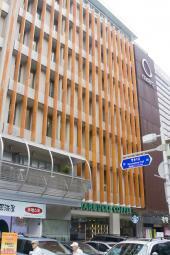 The rooms are equipped with supplies such as toothbrushes and shampoo, as well as transformers and ready to be a yukata. There is also a folding luggage rack is under the bed and bidet installed in all rooms! The room type is Corner King Room, Comfort Queen Queen, Shoppers Choice Comfort twin, triple and family suites room type which is great hotel for friends, family, and couples to stay. Euljiro-Ipgu station (subway line 2) is only a minute walk away and it takes 7 minutes to reach Myeongdong station (subway line 4). Nearby are Lotte Department Store, Lotte Duty Free Shop, Avatar shopping center, Migliore shopping mall and other general, acessory and clothing stores. ※ The hotel rules difficult about Non smoking room. It can be possible to Out if smoking in Non smoking room. * Iron and ironing board in the room on the 7th floor. * Water purifier, microwave are on the 2nd floor. * PC is in computer room on 9th floor. * The use of laundry 8:30 a.m. to 10:30 p.m. Washing machine, dryer, iron powder dispenser is available. ※ All the customers credit card information or deposit is required when you check-in. ※ If there is no additional cost when you check-out, the card data will be deleted automatically. ◎ Early check-in : no.